Are you ready for some . . . gators? The fourth quarter of Superbowl XLVI may or may not go down in history for its great football, but it will live forever in the memories of everyone who has ever dreamed of riding in RJ and J Paul Molinere’s airboat, having a cold beer with the Guist Brothers, or hearing Troy Landry yell “choot ’em” in their ear. Because this isn’t just the year of Superbowl XLVI, this is Swamperbowl I! Who’s the boss in the Atchafalaya? I’ll give you three hints: (1) his name isn’t Landry, Molinere, Guist, Cavalier, or Mitchell, (2) his only weakness is a soft spot on the back of his head about the size of a quarter, and (3) he’s the one who is going to get fired this season! This is a great moment for HISTORY. 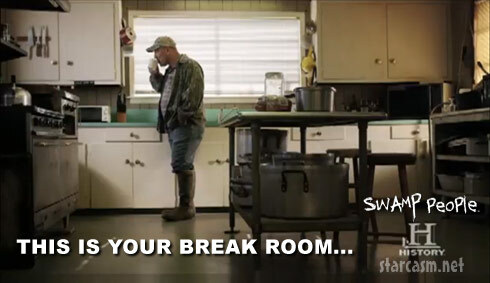 We are currently one of the top brands in the media landscape, and the #2 network for men, and Swamp People is one of our most successful shows — Season 2 of Swamp People averaged 4.1 million total viewers, which was a 32% increase over Season 1. This is a great way for Americans to get back into the Swamp of things prior to the new season. Congratulations Ms. Dubuc, History Channel, and everyone down in the bayou. Can’t wait to see what you have in store for us in Swamp People 3! Be sure to check out our posts on new regular Swamp People cast members Chase Landry, Blake McDonald, and Austyn Yoches!